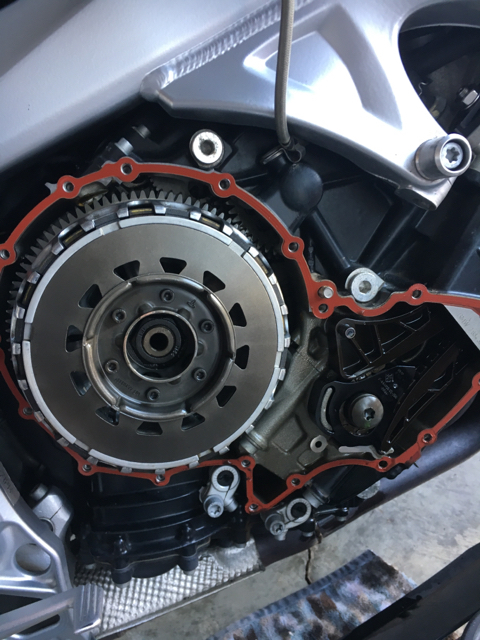 Anyone help with information on adjusting or replacing the oil pump chain while changing clutch plates? I have a 2006 K1200gt with 40,000 miles, I am going to start on the clutch next week, already have it torn down, just waiting to receive some grateful loaner tools. When I was looking in there the oil pump chain looks loose. Actually there are a couple of screws that can be loosened and adjust the tension. But, it is normally very loose. So don't be deceived. There is a inexpensive tool that is used to measure the tension. Don't adjust it snug just by eye. The drive gears are just stamped not machined and it is made to run a little looser than seems reasonable. 11 1 931 or order # 041 502. Insert eccentric gauge (No. 11 1 931) between the sprocket and the gearbox input shaft. Align the mark on the eccentric (arrow) at right angles to the oil pump drive chain. Use your hand to push the tensioning rail toward the chain and tighten screw (2). Few people mess with it. I really think it is worth it to buy the DVD and read through it for the factory details. You can integrate this with your Clymers and other information. Last edited by beech; May 2nd, 2018 at 11:29 am. I haven't seen anyone in videos replacing the clutch mention this. The shop manual addresses it, but is it necessary if you don't pull the clutch basket? No, But many times the clutch basket is trash. If it has notches from the plates, it is done. Oh boy! Definitely will check that. Thanks.